This is the story of a child soldier who got caught in the crossfire of the Sierra Leone civil war of the mid-1990s. 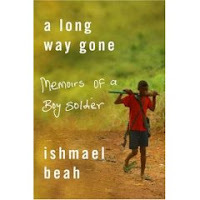 Along with his brother and some of their pals, twelve-year old Ishmael Beah was on his way to a talent show in a neighbouring village one day when rebels overtook his home, separating himself and his brother from the rest of their family. For weeks, he and his friends wandered through the jungles trying to survive before illness started taking its lethal toll. Before long, he found himself rounded up by government forces, fueled with cocaine, pills and pot and brainwashed into becoming a lethal killing machine as an early teen. He did this for two years before being rescued by an NGO and rehabilitated to the point where he's now able to tell his story. This book reads so well that it's hard to believe that Beah actually wrote it. With all due respect, this effort had to have the assistance of a ghost writer since Beah's first language isn't English, and his descriptive ability as well as the detail with which he remembers things is intricate. I'd also say that to communicate about these horrors so lucidly, he must have had very good doctors after being taken out of the conflict. He does spend a little too much time (100 pages out of a 230-page book) describing how he wandered through the jungles before being recruited into the child militia, and although things do get pretty grisly at times, he doesn't beat you over the head with violent imagery. Well worth a read, if only to remind you how low fascist organizations will stoop to advance their positions, and consequently, that Westerners shouldn't look at evil with only one eye open.